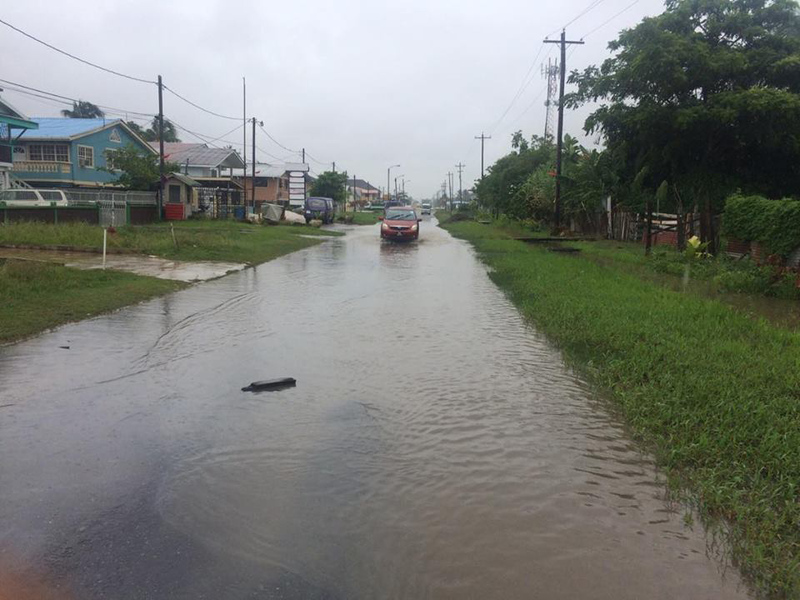 Several streets around the capital city were flooded yesterday after early morning showers. The Kitty Pump Station started working from 6 am yesterday and when the pump was turned off at 11 am most of the excess water had been removed from the communities in the vicinity. Stabroek News also visited the flood-prone Charlestown, Albouystown, Riverview, Ruimveldt areas, which were not flooded after the showers. However, in central Georgetown, there were those areas which were affected like always by rainfall. “This ain’t anything new. 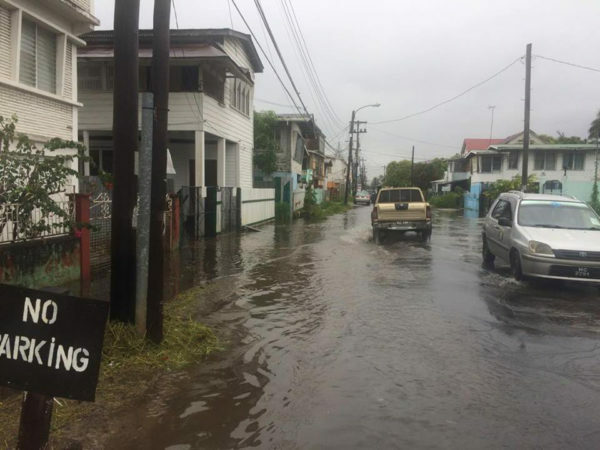 We always accustomed to this because when a cup of water fall the whole of Georgetown does flood and it does start with this street,” a resident of Quamina Street told Stabroek News yesterday after the rainfall had submerged most of the street between Camp and Waterloo streets. “I’ve been living here for a long time and I can’t remember the last time they dug the drains and I think that’s where the problem rises from. It’s been more than a decade since they have cleaned the drains and every time it rains this is the first place in the city that floods. 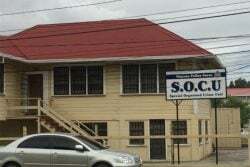 It always happens,” another resident added, while noting that the drains along the street were neglected even during the recent cleanup campaign. 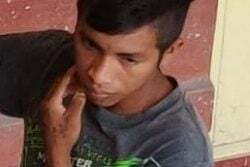 “All I remember them doing was weeding the grass by the drain and even on an empty lot that was occupied by vegetation but they didn’t clean [the drain] properly and dig it. Right now it’s so clogged with mud that you could stand [on it without sinking],” the resident said, while pointing out that because of the clogged drains the water does not flow properly. “Even when the rain stop and the sun shines and everywhere clear up, here does still got water lingering because of the drain. It’s been like this too long and the city has to look at it and clean these drains ’cause look just little rainfall and the street already flood,” the resident said, fearing that situation will only get worse when the rainy season begins properly. In addition to Quamina Street, several streets in North and South Ruimveldt were flooded along with several streets in Section ‘K’ Campbellville, running off Sheriff Street. 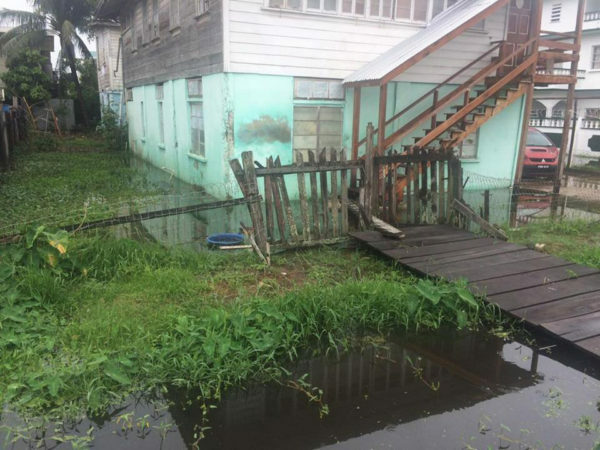 “Well it was surprising when I wake up this morning and I see the street flood because I don’t recall the rain falling hard last night and is not like it was a steady rain either,” a resident of South Ruimveldt told Stabroek News. “They doing all this cleaning up last year and what’s not and look it already flooding with lil rain and that raises concerns about when it rain now because we just come from a drought when the rain didn’t fall for months so it is going to fall nuff come May/June,” he pointed out, stating that while his yard is not flood prone, since he built it higher, he is concerned about the others who might not have higher yards and for the persons who live in flat houses. “I think people should start preparing for a flood and stock up on sand bags and them things early because it is going to flood, I just know it. People should starting putting them things up and what’s not so it doesn’t hit them and destroy they things,” he added, stating that the faster people act the less affected they would be if the rain becomes worse and it floods, which he expects in the coming months.